Undaunted by a forecast of fog, snow and icy rain, hopped a train into Philadelphia for a visit to Waterfront Winterfest held at Penn’s Landing during the holiday season. The blowing snow whipped around the bus as I caught a glimpse of the Benjamin Franklin Bridge from the last stop on the route. Despite the snowy weather, the Blue Cross RiverRink was filled with skaters, including Santa. A forest of trees and shrubs, lit with twinkly white lights, surrounded the ice rink. A warming tent held a village of restaurants and small shops. Skaters huddled around fire pits with the aroma of burning wood scenting the air. Blue lights outlined the trees along the Delaware River. As difficult as holding the camera was while trying to get videos, the snow enhanced the site making the seaport truly a winter festival. A short walk, while holding an umbrella that billowed up and down in the driving wind, brought us to the Independence Seaport Museum, which was hosting its 4th annual Seaport Parade of Lights. The Jupiter, a vintage tub from 1902 and maintained by the Philadelphia Ship Preservation Guild, led the parade of decorated boats, including both working vessels and pleasure craft. The crowd, having a great time watching the boats glide out of the blizzard, applauded the floating light displays as each passed by. 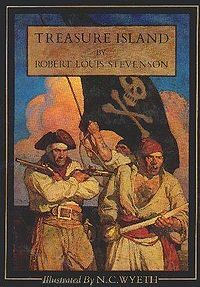 The last time my sister, Jean, and I met pirates, we had just happened upon the Beaufort Pirate Invasion, taking place as we stepped into the battle scene a summer ago in the seaside village in North Carolina. We promised we would not let too much time go by before finding another similar event. The opportunity came along when the Independence Seaport Museum hosted its 2nd Annual Old City Seaport Festival, in a weekend-long celebration with music, crafts and Tall Ships, with a smattering of pirates. On the first evening, the festival began with the Parade of Boats as they came to port just below the Ben Franklin Bridge. On the next evening, the AJ Meerwald, Gazela Primiero Pride of Baltimore II, Mystic Whaler Kalmar Nyckel, Virginia and Hindu were destined to clash in a pirate battle. 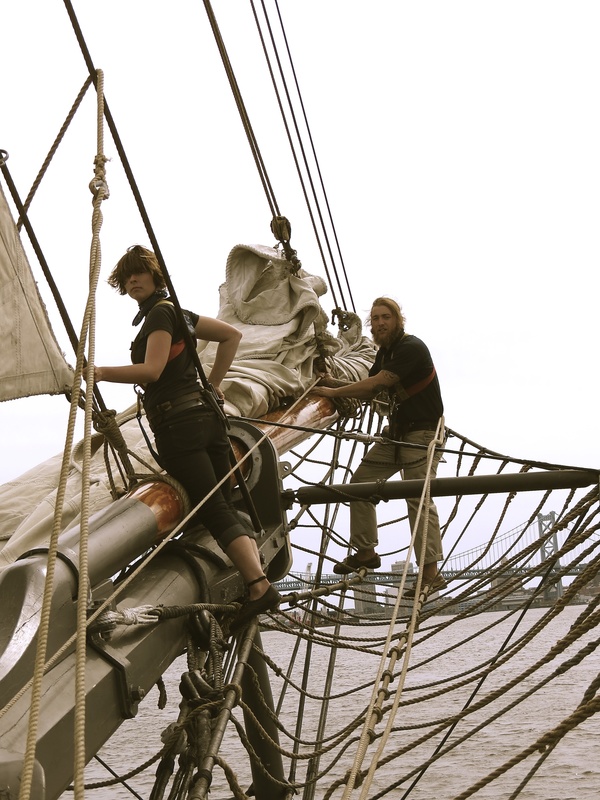 We signed up to be aboard the Kalmar Nyckel. Built by the Dutch, the original ship dated back to around 1625. This flagship of Governor Minuit brought settlers to the New World, establishing the colony of New Sweden on the banks of the Christina River in 1638. An informative and lovely guidebook on the ship’s history is available on the web. 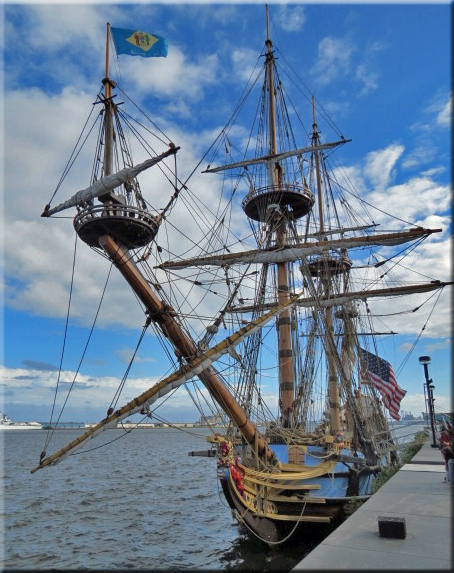 The ship was rebuilt in Wilmington, Delaware, and commissioned in 1998. The Kalmar Nyckel is an example of a full-rigged type of pinnance, which is a kind of boat, generally modest in size, that was used either as a merchant vessel or small warship. Pirates prized these ships because they had maneuverability through rugged coastlines and good speed to outrun any vessel that might be in pursuit. A quick search into a few authoritative sources reveals the extent that colonial villages were affected by the onslaught and fear of attack from both foreign pirates, truly a multi-national representation including the French, Spanish, Dutch and English, as well as the local variety, with the first raid recorded in Lewes, Delaware, back in 1672. Seems that Blackbeard also frequented the Delaware, as he supposedly stopped into the many taverns along the waterway. Jean had this idea that since we were going to be onboard during a pirate battle, we should dress the part. We cobbled together costumes from outfits in our closets (wardrobes should always include a few whimsical pieces when transformations are called for), and we were ll set to go with Jean’s orange and black-stripped socks and my hat, replete with feathers. Did we look like real pirates? . . . oh, not a chance, but maybe we could have fit in with Pirates of the Caribbean crew. We took the train into center city and headed down toward Penn’s Landing. We shook our heads as we passed the closed and shuttered Constitution Center, thanks to those idiots in Congress, the scourges of the seven seas, who shut down the government. By chance, we happened to run into my son, John, who was participating in a demonstration against Monsanto, taking place just across from the Constitution Center. Activists had designated October 12 as International Day of Protest against the company because of questions around food safety. Fellow WordPress blogger, Jeff Nguyen, has written an excellent post on Agent Orange and Monsanto. After bidding John adieu, we continued walking to the Seaport Museum. The wind whipped around the buildings as we approached the Delaware River, were we could see white caps on the churning waters. I thought back to a sail on the Amistad, which had to be postponed because of high winds and wondered if the battle would take place. We walked along the pier where vendors were selling everything from jewelry to “wench wear.” Several organizations had also set up information booths, and we spoke with members of the Steamship Historical Society of America. Shiver Me Timbers! Striped Socks Spikes a Spirited Sentiment! The tall ships lined against the pier, but we were most excited to see the colorful Kalmar Nyckel. Parts of the boat had just been freshly painted, and we admired the detail work. 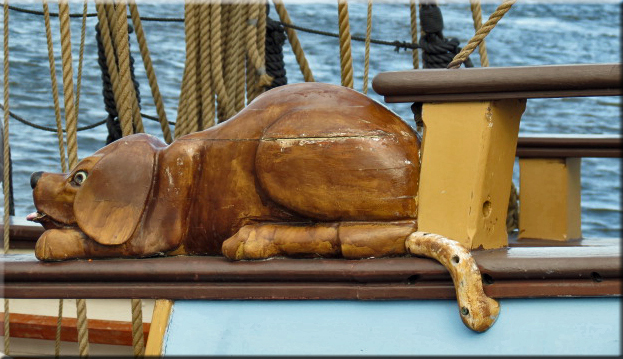 On either side of the ship, a carving of a dog rested on the railing, one eye open to the sea and closed to the inside. The winds were blowing wildly by this time, so we were not surprised when the crew told us there was little chance the ship would be part of the pirate battle as they could not negotiate the vessel away from the dock. Our plans were not cancelled, however, as the smaller boats were still scheduled to sail. The crew reassigned us to the Mystic Whaler, a late 19th century coastal cargo schooner, for our pirate adventure. Geoff Kaufman welcomed us onboard with songs of the sea. Accompanied by his concertina, an instrument made in England in the 1920s, Geoff offered a song for every activity on the schooner. He played songs that encouraged the crew to work in rhythm, and sang ballads for returning to port after the voyage. Geoff also sang old favorites, like “What to do with a Drunken Sailor,” with passengers joining in the song fest. Geoff’s music added to the rollicking motion of the ship. I wish I could have captured more music, but even my wind filter on the camera could not remove the sound the pounding gusts. Ahoy, Me Hearties–the Battle Begins! We buttoned our coats and secured our scarves as the schooner weighed anchor, sailing from the dock to face our opponents in battle. With the thunderous blasts of the cannon, the engagement was underway. The smaller schooners whipped through the water, cutting in front and back of the larger vessels. 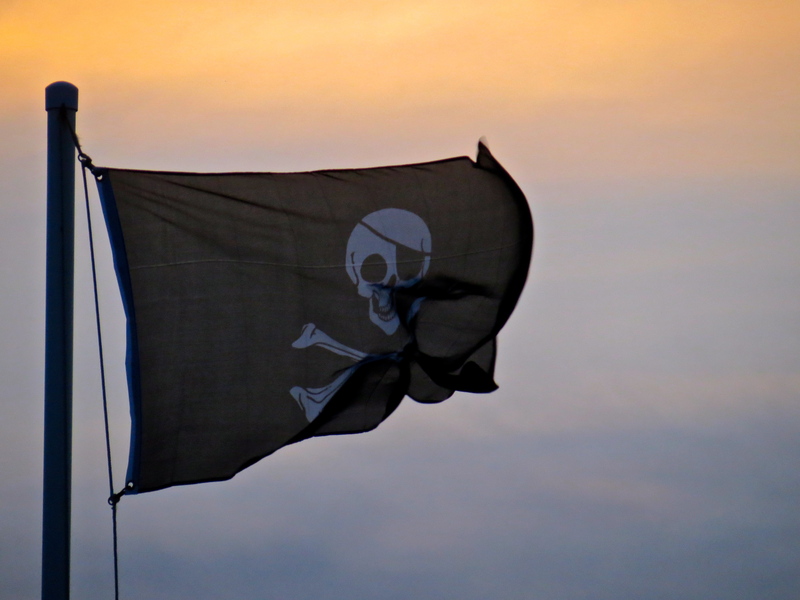 With Jolly Rogers fluttering, insults were hurled across the water. “You scurvy scallyways! Arrgh! We’ll have ye walking the plank! Someone on the A. J. Meerwald had the audacity to call us, “Dirty dogs!” Passengers joined the crew in hoisting the sails with a heave ho to Geoff’s rhythmic sea shanty. The battleship New Jersey and the Olympia, war ships from other eras, contributed their big guns to the melee. Windblown, but throughly enraptured by the experience, we disembarked from the Mystic Whaler to the strains of “Leave Her.” We returned to our landlubber status, looking for a tavern to splice the main brace. 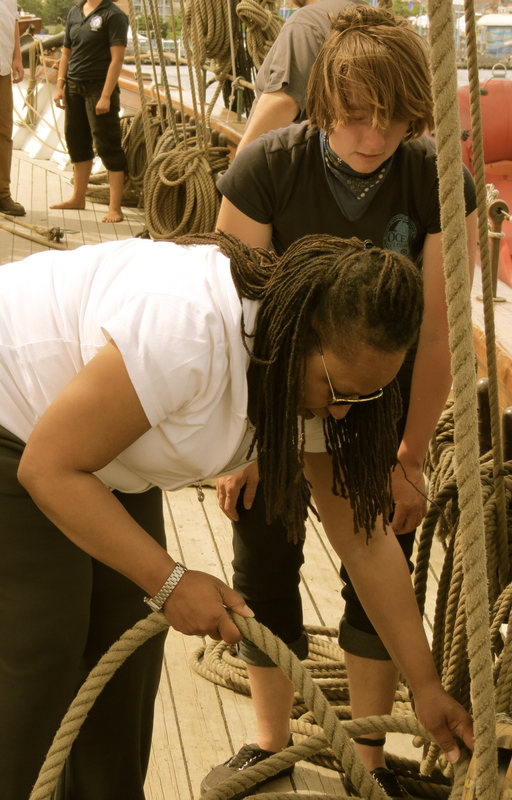 The chance to experience a voyage on a schooner while reflecting on the circumstances that brought free people into the imprisonment of slavery was an opportunity I could not miss. 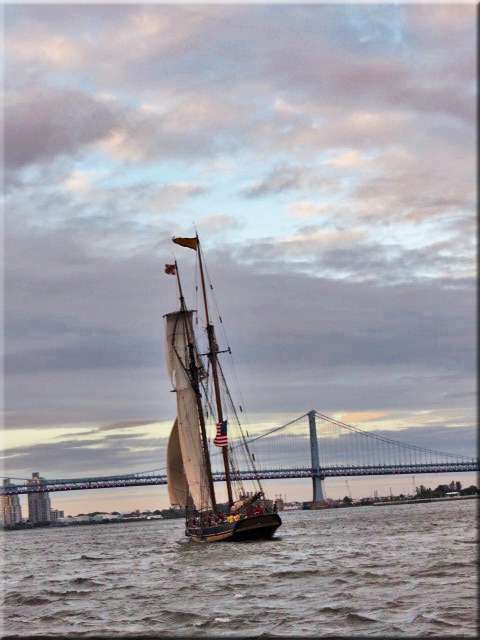 On Saturday and Sunday high winds cancelled the river tours aboard the Freedom Schooner Amistad, but by Monday the breezes died down, and we were good for a launch from the Independence Seaport Museum’s dock. The Freedom Schooner Amistad, a replica of the original La Amistad, has collaborated with international organizations throughout the Americas, Europe and Africa to commemorate the 200th anniversary of the former British empire and the United States abolishing the slave trade in the first decade of the 1800s. Before starting the sail on the Delaware River, I had to get “onboard” with some research on the history of the La Amistad. 1840 engraving depicting the Amistad revolt. Wikipedia. In 1839, Portuguese slave hunters kidnapped Africans from Sierra Leone and sent them to Cuba, a center for the slave trade. Treaties at that time banned the practice; nevertheless, Spanish planters purchased 53 Africans, including four children, who were shipped toward a plantation in the Caribbean aboard the schooner La Amistad. The Africans seized the ship, killing the captain and ordering the planters to sail to Africa. On August 24, 1839, the La Amistad was seized off the coast of New York, and the Africans were imprisoned on charges of murder. Despite having the charges eventually dismissed, the Africans were held in prison because of the issue of property rights. The case went to the Supreme Court; the justices ruled in favor of the Africans, and 35 survivors were returned to Sierra Leone. The Amistad case advanced the abolitionist movement, which eventually led to the abolition of slavery. Julia Weathers related the story in her own words . . .
What is most valuable about Amistad is the way it provides faces and names for its African characters, whom the movies so often make into faceless victims. The Amistad Rebellion: An Atlantic Odyssey of Slavery and Freedom by Marcus Rediker, published in 2012, retells the story from the point of view of the slaves. An article in the Philadelphia Tribune offers a detailed description of this book. Previous films and books centered on the legal battle and interplay of the politicians, abolitionists and judges rather than on the rebellion and the experience of the Africans. By taking this short voyage on the Amistad, I could imagine how the first sparks of rebellion were ignited against those who had the audacity to believe they could enslave another human being. Twelve members of the crew are part of the Ocean Classroom Foundation, an organization that offers programs of sea education to students. Watching the students do their tasks was amazing as they climbed the rigging and hoisted the sails. What was great about the experience was the crew encouraged passengers to take part in helping out with some of these chores. Passengers pulled the ropes in unison to bring the sails into the wind. A student assisted my friend, Frances, in stacking the rope in a pattern of thirds. It then occurred to me that this is where the expression “learning the ropes” came from. The Amistad, built in 2000, is a 129-foot Baltimore Clipper and a replica of the original vessel. Classified as a Sailing School Vessel, the schooner is equipped with modern navigation equipment and is certified to make international voyages. The rig and construction are authentic; and as I walked the deck, I admired the wooden pulleys, steering wheel and mast, which retained that old-world feel of craftsmanship, the wood shining with the richness of spar varnish. The original ship has been long-lost somewhere in the Caribbean, but the Freedom Schooner Amistad will not let the story of 53 determined freedom fighters be forgotten. “Dry Your Tears Afrika,” written by John Williams, is from the movie, Amistad. Thanks to Abi Iverson for rearranging our tickets and providing additional information for the blog.